This is one of the recipes that I remember as a kid my mom and grandmom used to regularly make for us. Another simple recipe but delicious and very good for us. This is the type of food that kept us healthy and strong. Something we need to get back to these days. There is no set recipe for minestrone, since it can be usually made out of whatever vegetables one has. It can be vegetarian, contain meat, or contain an animal bone-based stock (such as chicken stock). Angelo Pellegrini, however, argued that the base of minestrone is bean broth, and that borlotti beans (also called Roman beans) “are the beans to use for genuine minestrone”. Because of its unique origins and the absence of a fixed recipe, minestrone varies widely across Italy depending on traditional cooking times, ingredients, and season. 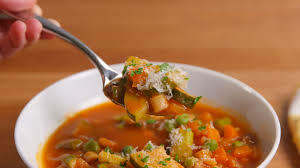 Minestrone ranges from a thick and dense texture with very boiled-down vegetables, to a more brothy soup with large quantities of diced and lightly cooked vegetables; it may also include meats. In modern Italian there are three words corresponding to the English word soup: zuppa, which is used in the sense of tomato soup, or fish soup; minestra, which is used in the sense of a more substantial soup such as a vegetable soup, and also for “dry” soups, namely pasta dishes; and minestrone, which means a very substantial or large soup or stew, though the meaning has now come to be associated with this particular dish.